Polyurethane Films produced by A.F.I. offer exceptional abrasion resistance, tensile strength, and chemical and laundry resistance. We produce polyester and polyether based polyurethane films. These adhesive films are soft, show good low temperature flexibility, and have high impact resistance. The UAF Series is available in roll form on release paper, without release paper (“Stripped”), or laminated to fabric, film or foil. A.F.I. Polyester Adhesive Films are versatile, high performance heat activated adhesives primarily used on fabrics, metals, plastics and wood. The PAF Series is available in roll form on Release Paper, without Release Paper ("Stripped"), or laminated to fabric, film or foil. Another advantage offered by A.F.I. is the ability to color pigment your film for your specific needs. A.F.I. Polyethylene Adhesive Films are the most economical selection for bonding both porous and nonporous surfaces. Our Polyethylene family of adhesives includes Ethylene Vinyl Acetates, Ethylene Acrylic Acids and Acid Terpolymers. A.F.I. Nylon Adhesive Films are typically used to bond fabrics (including nylon fabrics) and embroidered emblems. They are also used where resistance to temperature, oil and water is a requirement. 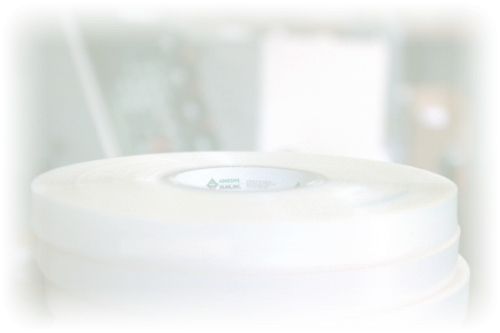 Whether you require tapes, wide width rolls or laminates, we're ready to accommodate you! We promote solvent free products to protect the environment, the health of your employees who work with our products and the customers who ultimately purchase your products. When we produce a new adhesive or adhesive blend, we assign an EXF series (experimental) number. When that product is sold on a regular basis, it is renamed with a new part number in one of our standard product series (EAF, NAF, PAF, TAF or UAF). The EXF series of products includes the following: New adhesives or adhesive blends extruded on release liner produced the same way as our standard series of products using a new or different combination of raw materials. Custom extruded products: Adhesive coatings may be applied directly to a fabric or other substrate in place of release paper. Examples of a custom extruded product are adhesive coated fabrics, plastic films and nonwovens. Custom laminated products: Adhesives that are produced on release paper can be heat laminated to fabrics, films, foils or nonwovens. We also carry Pressure Sensitive Adhesive Tapes (PSA series) and Blotting Paper. Pressure sensitive tape is used on fabric labels, emblems or appliqué for permanent attachment or temporary positioning prior to sewing. Blotting paper is used to remove excess adhesive residue (can be used with heat activated adhesive too) in the process of laminating adhesive to individual rolls or single items such as labels, emblems, appliqué or decorative trim. Preview our PSA Series Guide to select the most appropriate adhesive for your bonding requirement. For the EXF series, please contact our technical staff to discuss your particular application and / or request samples. The EAF Series offers an excellent bond to fabrics, plastics & TPU foams. It is available in roll form on release paper, without release paper ("stripped"), or laminated to fabric, film or foil. Use the EAF Series Specification Chart as a guide to select the most appropriate adhesive for your bonding requirement. The NAF Series is available in roll form on release paper, without release paper ("Stripped"), or laminated to fabric, film or foil. Use the NAF Series Specification Chart as a guide to to select the most appropriate adhesive for your bonding requirement. Preview our PAF Series Specification Chart as a guide to select the most appropriate adhesive for your bonding requirement. Please contact our technical staff to discuss your particular application and / or request samples. The UAF Series offers an excellent bond to fabrics, plastics & TPU foams with resistance to temperature cycling. A.F.I. Polyethylene Adhesive Films are the most economical selection for sealing both porous and nonporous surfaces. Our Polyethylene family of adhesives includes Ethylene Vinyl Acetates, Ethylene Acrylic Acids and Acid Terpolymers. When we produce a new adhesive or adhesive blend, we assign an EXF series (experimental) number. When that product is sold on a regular basis, it is renamed with a new part number in one of our standard product series (EAF, NAF, PAF, TAF or UAF). The EXF series of products includes the following: New adhesives or adhesive blends extruded on release liner Produced the same way as our standard series of products using a new or different combination of raw materials. Custom extruded products Adhesive coatings may be applied directly to a fabric or other substrate in place of release paper. Examples of a custom extruded product are adhesive coated fabrics, plastic films and nonwovens. Custom laminated products Adhesives that are produced on release paper can be heat laminated to fabrics, films, foils or nonwovens. We also carry Pressure Sensitive Adhesive Tapes (PSA series) and Blotting Paper. Pressure sensitive tape is used on fabric labels, emblems or appliqué for permanent attachment or temporary positioning prior to sewing. Blotting paper is used to remove excess adhesive residue (can be used with heat activated adhesive too) in the process of laminating adhesive to individual rolls or single items such as labels, emblems, appliqué or decorative trim. Preview our PSA Series Guide to select the most appropriate adhesive for your bonding requirement. For the EXF series, please contact our technical staff to discuss your particular application and / or request samples.